Barcelona put on yet another impressive display and allowed Lucho to tie Guardiola’s record of winning 11 straight games with Barcelona. The recent change in positional structure from Barcelona has led to better utilization of their players, which in turn led to the current winning streak and their 5-0 victory over Levante. The general positional structure of both teams. Levante defended in mid-block 4-4-2 which was horizontally quite compact. They moved from side to side in an intense manner, but in their overall confrontations with the Barcelona players they were passive and looked only to guide Barcelona away from the center – where they could attempt to isolate them on the flanks. They struggled to do this however, because Barcelona is incredibly difficult to control. Barcelona looked to build their game from the flanks and halfspaces anyway, so Levante didn’t do much to disrupt their general strategy. Messi began the game as the central forward and acted mainly as a receiver of the ball within the combinational movements rather than an initiator. Of course, he attempted the finish off the attacks as well. On the left flank Neymar played as the widest player while Adriano was in the halfspace and Xavi played in the center. For the beginning phases of the game this is where most of the action was. Xavi in particular had a great game due to the fact that Levante played in a passive 4-4-2. He drifted into the halfspace on the side of Levante’s 2 forwards where nobody pressured him and began dictating the game from there. His excellent decision making in regards to passes helped Barcelona’s circulation immensely. Xavi frequently skipped the closest or next-closest pass to play directly across the field or directly to the forward. 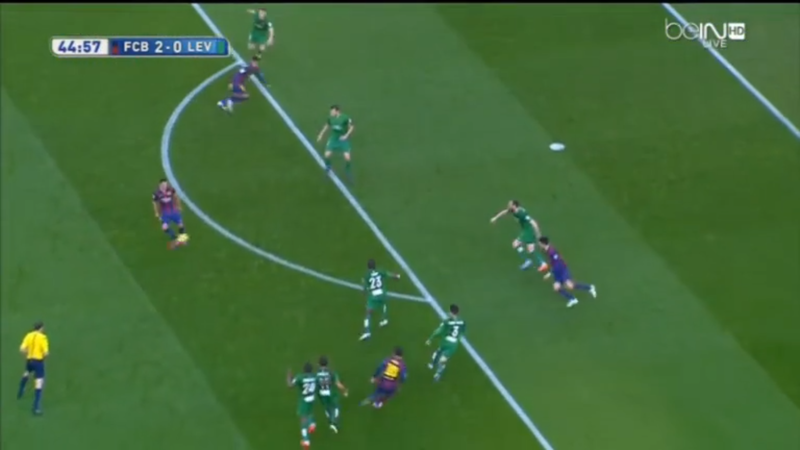 This, coupled with his excellent technique, allowed Barcelona to move from one halfspace to another and switch the point of attack frequently. Neymar would initiate the combinations and move inside very often. It was quite common to see him receive the ball on the touchline, drop his hips and feint his body down the line, and then accelerate inside quickly. Once he has beaten his man towards the inside he had Xavi, Messi, Busquets, and others to support in the penetrative combination play. Though his dribbling and combination skills were very good, he lacked the creative passing ability in regards to creating chances that Messi showed later – when looking at the specific situation of the winger moving inside off the dribble. Adriano played a large part in the initiation and support of the combination play, often making balancing runs and playing a ‘shallower’ (rather than penetrative) role in regards to passing. Many of his balancing runs were towards the outside due to Neymar’s diagonal dribbles towards goal. He frequently played in some very accurate crosses when the ball was played towards him – especially later when Messi was creating from the opposite flank. On the right flank it was Montoya who played the widest. This was most likely due to the fact that it would be the most stable role for him – receiving switches/passes towards the flank and then playing the simple pass with no real pressure. If it were Alves playing as the right fullback it would be very likely that the role of the right fullback would’ve been more towards the inside and one of higher involvement in combination play. Pedro moved inside towards the halfspace while Rakitic played in the center on the right. The fact that Pedro and Adriano were used more towards the center shows that Lucho also thought about Barcelona’s stability in counterpressing (which was very successful throughout the game). Rakitic had a similar role to Xavi on the opposite side, but he had his own interpretation of it as expected. He looked to balance all of Messi’s evasive movements from the center as well. If Messi moved deep and towards the right halfspace – Rakitic moved high and towards the center, and so on. Barcelona used wide combinations in order to de-stabilize the Levante defense on the flanks and then switch the ball to the far side – exposing Levante’s horizontal compactness with a lack of good defensive pressure. Busquets was frequently involved in the combinations moving towards the center and through to the other side, as well as adding his own unique touch – as always. He would sometimes disrupt the flow of the circulation to play his incredible vertical passes that split the opponent midfielders and defenders. Of course, he would also drop into the defensive line to aid Barcelona’s circulation. He is incredibly quick in tight areas and provided a flow and continuity to Barcelona’s possession that was very difficult to cope with for Levante. Sergio played a large part in Barcelona getting the ball wide and into advantageous positons. Bartra counterpressing in transition just before he assisted Messi. Barcelona also used many long and high passes. Something Mascherano and Busquets are quite talented at. Bartra played as the other central defender and had a great game. He also played a part in the attack – in the right halfspace. Bartra pressed very well and even won the ball in one defensive transition where he moved forward afterwards and assisted Messi’s goal. He won the ball some 30 meters from goal and timed his pass through the defense quite well. This scene exemplified his overall contribution to Barcelona’s 5-0 victory. A combination that ends with a 1-2 between Messi and Xavi. Note the amount of defenders Messi’s draws out of position before Xavi chips the ball through. Messi began moving wide and Pedro moved into the central forward position. At first this was just a result of combinational and fluid positional movement, but after the goal it was a permanent switch (around the 20th minute). The first goal came when Messi cut inside from the touchline position (frequently aided by vertical runs by Rakitic or Montoya to drag defenders away and allow a path inside) and Neymar made a penetrating run on the far side. This was particularly effective because Barcelona naturally had high numbers on each flank, and because Levante left the far side quite open. Suarez playing as the 9 later in the game. Messi moving inside as the initiator of the combinational play also helped Barcelona. With the increased momentum and penetrative aspects in the combinations Barcelona was much more dangerous. Later Suarez came on while Neymar came off. Suarez played as the 9 while Pedro occupied the left flank. Suarez has a different role now in comparison to his very mobile role at Liverpool. He mainly occupies his position and doesn’t make as many runs or evasive movements – which goes against his natural tendencies. Even so, he is still incredibly talented and efficient in his more static role. He scored an INCREDIBLE goal in the game. Levante very rarely had the ball. When they did they focused mostly on trying to penetrate the Barcelona defense in wide areas and then playing crosses into the box with runners trailing behind. Overall, it was not a very successful strategy. Lucho’s men are on the verge of breaking Guardiola’s record next week vs. Malaga just before their encounter with Manchester City. Barcelona look very impressive and are in the conversation in regards to having another possibly historic season if they continue in this manner. They are technically, tactically, and strategically sound and shouldn’t be overlooked. It will be exciting to see what the rest of their season has in-stored for us!